Dixie here - I've been writing this site for almost two years to share pictures, images, links, etc with others who are Izannah enthusiasts. I generally don't refer to my own artistic works here, other than putting a link in to my site. 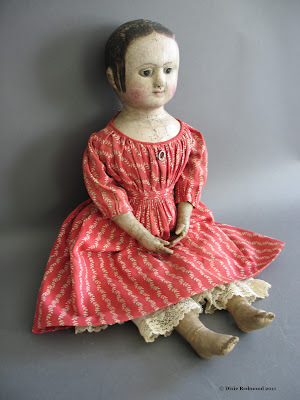 But my next project is on Izannah Walker dolls, so I want to give readers the opportunity to know what I've been up to. Later in December I will release my Izannah Walker type pattern and offering an online Izannah Walker Workshop in January. (This class has finished but the pattern is available). 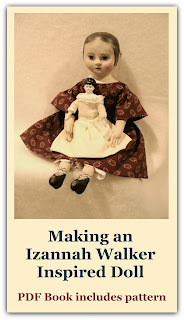 Click here for more information on the Izannah Walker Workshop. Oooh Dixie, I can not wait to take this wonderful class, i will be there or be square or how ever it goes, but i'll be there!!!!!!!!!!!!!!!!!!!!!!!! !